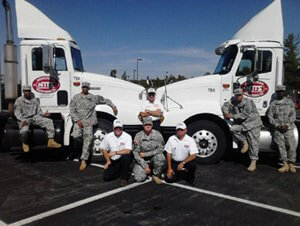 Fort Drum is the location for a part-time Class A CDL training course designed for active duty soldiers or eligible veterans who wish to develop civilian tractor trailer experience. This training provides fundamental CDL-A permit preparation with HAZMAT endorsement, DOT rules and regulation preparation in log books, backing maneuvers, pre-trip inspection, and driving on a 10-speed manual transmission. Therefore, soldiers not only have a CDL, but they also have the training to prepare them to safely drive a commercial vehicle. This part-time course meets two evenings and one weekend day weekly for 13 weeks and is taught on-site at Fort Drum at Clark Hall. Eligible active duty soldiers and veterans may use Post-9/11 GI Bill® Benefits, if qualified. NTTS has contracted with the Department of Defense (DOD) with a Memorandum of Understanding (MOU) to train at Fort Drum, NY. Upon completing their military obligation graduates of this program have been provided job placement assistance with local, regional and over the road driving positions with major tractor trailer companies. These carriers visit the students on a monthly basis to inform them of the different driving positions, wages, benefits, and other opportunities that are available in this high demand occupation. Some of these carriers have positions throughout the United States and will be glad to assist the transitioning soldier to find employment in any state.